The biggest breakthrough in laser technology has been achieved in South Africa. Under the supervision of Andrew Forbes, Sandile Ngcobo has developed the world’s first digital laser that has been taunted as a game changer in many technology and research sectors globally. After two years of trial and error under the Council for Industrial and Scientific Research (CSIR) Ngcobo was able to incorporate an “LCD miniature television” inside a laser device to modulate the type of laser beam emanating from the laser. This is a big achievement as attempts by top researchers and physicists the world over to come up with a similar device have all failed. A very simple laser device normally is made of a flash rod that supplies the energy for exciting electrons, a laser medium that is excited by the flash rod and two mirrors for reflecting back the released laser light. One of the mirrors is partially coated to both allow emitted light out and bounce others back into the laser medium. What Sandile did is to replace the totally coated mirror with an LCD digitized screen to pre-determine the properties of the light that will be bounced back to the laser medium. “Our digital laser uses the LCD as one of its mirrors that is fitted at one end of the laser cavity. Just as with LCD televisions, the LCD inside the laser can be sent pictures to display. When the pictures change on the LCD inside, the properties of the laser beams that exit the device change accordingly,” said professor Andrew Forbes, leader of CSIR’s mathematical optics research group, where the work was done. In the normal laser, both mirrors reflect back photons of light at specific energy and phase properties to further aid in releasing photons with similar properties in a process called amplification by stimulated emission of radiation. This process is what gives laser its name as the amplification in question is the amplification of light so LASER is Light Amplification by Stimulated Emission of Radiation. Replacing one of the mirrors by the LCD screen means a different set of photons with specific energy and phase properties can be amplified and emitted. 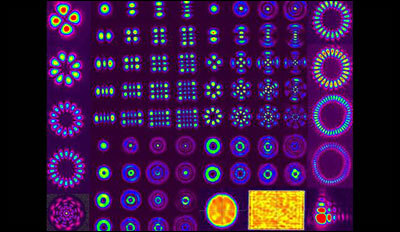 The picture below taken by Ngcobo’s laser shows emission of different beams of light with different properties as revealed by the different patterns displayed. Normally it would require different laser devices to produce the different patterns but Ngcobo’s invention means the different patterns can be produced by the same laser device. The other available alternatives for producing such different patterns is to replace one of the mirrors with another mirror of different curvature for every unique pattern or the researcher may decide to manipulate the beam after emission using spatial light modulators. These alternatives are time consuming and expensive exercises. Laser technology is a multi-billion industry applicable in fields of medicine (laser surgeries, eye treatment, etc), electronics (DVDs, Blue Ray Discs, printers, barcode readers, scanners, pointers, etc), Welding, and Research. Now with the ability to use the same laser device to generate different light beams each with specific energy and phase properties as needed, the advancements that can be made in these industries are limited only be the imagination. “I believe the digital laser will be a disruptive technology. This is technology which may change the status quo and which could create new markets and value networks within the next few years or decade,” said Ngcobo, who conducted the work as part of his Ph.D. studies at the University of KwaZulu Natal. 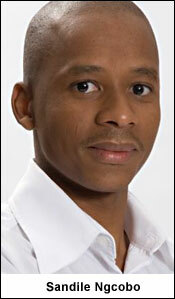 Well done Sandile Ngcobo, Andrew Forbes and CSIR and kudos for making Africa proud.